Parenthood comes with a lot responsibility. Every aspect needs to be weighed and considered before you make a decision for your child. Be it something as small as choosing the right diapers for them from the time they are born. Today, with so many options available in the market it could be quite mind-boggling to pick the right kind of diaper. But fret not, we are here to help you answer some of the most intimidating questions that arise in every parents mind like whether to use the disposables or cloth diapers, what material is the best, what are the different types, how expensive would they be and so on. In this article we would be sharing our experiences and telling you about some of the best cloth diapers for newborns available for your little one. We hope that after reading this article you would be able to take this decision in no time and select the right diaper based on what best suits your baby’s activity level and skin type. Before we move on the products available, we would like to introduce you to cloth diapers and the benefits of using them. Cloth diapers are an improved and sophisticated version of the traditional diapers that were used by our parents and grandparents. They are comfortable, chemical free, economical and environment friendly. If you buy the one size diapers, you can keep using them from the time the baby is born till they are potty trained as you can adjust the diaper’s fitting based on your baby’s size. When it comes to convenience they might not be the best option as they need to be laundered separately but once you get used to them this is hardly seen as an inconvenience. The best part is they are absolutely free of chemicals which reduce the chances of your baby having any diaper rash and getting other serious health problems that are caused by the chemicals present in the disposable ones. 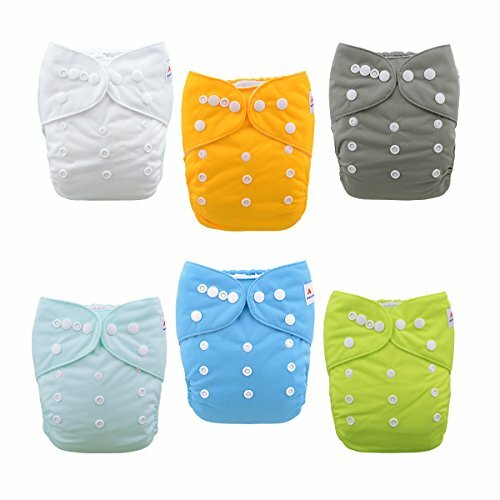 These best newborn cloth diaper prefolds by Alvababy are Pocket cloth diapers where the outer cover is made of polyester with waterproof and breathable TPU and inner lining of suede cloth. The inserts are made of 3 layered super absorbent microfiber. This top best cloth diaper pack contains 6 diapers with 12 inserts. They come in a variety of cute designs for both girls and boys but the prices vary with the designs. You can adjust the fit of the diaper with the help of the bottom three rows of snaps and can be used till your baby is potty trained. It comes in one size 15inches in length X 13inches in width and fit most babies from 6.6 to 33+ pounds. Alvababy prefolds has great reviews on Amazon with a rating of 4.5/5 by 243 reviewers. The customers love the quality, easy of use and fit. It’s one of the cheaper options available in the market and absolutely value for money. Only 8% of the customers have rated it 3 starts or less. Some customers found stuffing the inserts is comparatively more difficult as the opening of the pocket is at the back. Some customers complain of them leaking from the sides and not being water proof from the front so if your baby sleeps on their tummy you could have leakages. Our second best newborn cloth diaper, the Babygoal baby cloth prefolds are one size pocket diapers for both boys and girls with polyester outer layer with waterproof and breathable TPU and suede cloth inside which keeps your baby dry. These top best cloth diapers are suitable for babies from 3kg-15kg. The pack contains 6 diapers, 6 3-layer microfiber inserts and 4 3-layer bamboo inserts. The size of the diaper is 15” length X 13” width which can be adjusted to your required size with the help of the different rows of buttons. The inserts come in a standard size of 13.7” x 5.5”. Babygoal have taken a lot of effort to prevent leakages and wing droop with hip snaps and crossover snaps and also comfortable elastic at the leg area. Customers have really good things to say about Babygoal diapers and have rated them 4.4/5 on amazon by 486 reviewers with only 14% with 3 stars or less. This is what the customers have to say: They are comfortable, leak proof and have a great fit. You might have to use more than one inserts if your baby is a heavy wetter. The inserts included in the pack are not very absorbent especially the bamboo inserts. 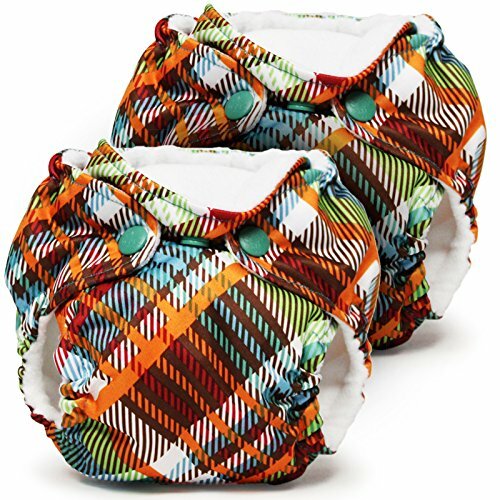 Wegreeco pocket diapers come in adorable designs and patterns for both boys and girls. The pack includes 6 diapers, 6 diaper inserts and 1 diaper bag. The outer layer is Waterproof and breathable PUL with 100% Suede cloth on the inside. The inserts are made of two outside layers of bamboo and two inner layers of microfiber which makes them comfortable and super absorbent. They can be adjusted as per the baby’s size and are suitable for babies weighing 8 pound up to 33 pounds. The multi-stage adjustable snaps at the waist and the front help you secure the diaper and get the desirable fit. They have a good rating on amazon of 4.6/5 but by only 35 reviewers. Customers are very impressed with the quality and fit. The patterns are adorable too. But not the best for newborn babies as they are a little big and result in leakages. 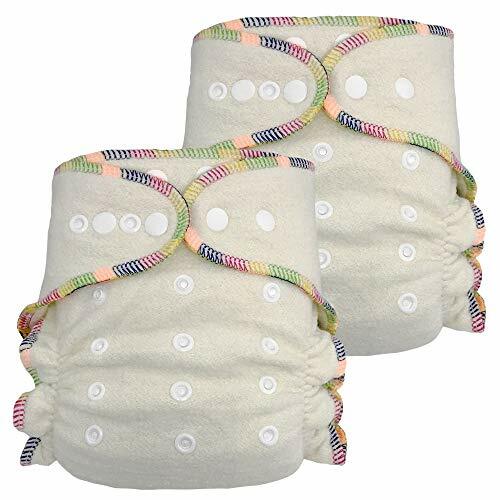 Mama Koala cloth diapers are ideal for babies weighting 8 pounds to 35 pounds and can be customized to get the perfect fit with the 3×3 rise snaps. They are sold individually with 1 one-size 3-layer microfiber insert. They keep the baby dry and lock the moisture from coming out of the diaper. The outer layer is made of breathable, waterproof thermoplastic polyurethane (TPU) and suede cloth is used to make the inner layer. On amazon they have been rated by 107 users with a rating of 4.7/5. The users have really appreciated the quality and fit of the diapers which prevents leakages. Only 5% of the users didn’t like them too much and gave a rating of 3 or less. Their main concern was the inserts which are not as absorbent and have to be changed more frequently as compared to the other brands. No need to buy in bulk. Individual packs available. Heavy wetter fitted cloth diapers are soft and give the child a comfortable fit. They are made entirely of super absorbent Hemp/Organic Cotton material and great for heavy wetters. The diaper can used from the time the baby is born till they are about 3 years old. The snap buttons are provided to adjust rise to desired size. Waist tab snaps provides a snug fit for small waists. The pack contains 1 fitted cloth diaper with 2 inserts. The user rating is 4.1/5 by just 38 reviewers on amazon with 76% favorable comments. They have great absorbency but a little cumbersome to secure them. Becomes very bulky with the waterproof cover but a good solution for nighttime. GroVia O.N.E is an all in one best cloth diapers with wonderful absorbency made up of multiple layers. The outer layer is made of 100% Water Resistant Polyester TPU, the hidden inner layer of 100% polyester microfiber, the soaker of 100% cotton topped with 100% polyester microfleece and the body lining of 100% polyester microfleece. They have both hook & loop as well as snap closures to secure the diaper and get a comfortable fit. The modular snap allows for customization and use till your baby is potty trained. They are expensive but totally hassle free. With a 4.4/5 rating by 235 users on amazon, GroVia O.N.E is rated for its ease of use and absorbency. Used widely for overnight and naps. But not great for skinny babies as the gaps increases the changes of leakage. Rumparooz diaper cover is perfect for newborns, toddler and can be used till it they are about 15 pounds. You can adjust it to up to 3 sizes. It is made of water resistant polyester TPU and comes with snap down front. You can use flats, prefolds, contours and fitted under them which need to be bought separately. As per the reviews on Amazon the customers like the Rumparooz for its quality and would recommend it for smaller babies. But as the baby grows these covers tend become tight and give the perfect fit even with the adjustable snaps. The covers are rated 4.3/5 by 1003 reviewers. 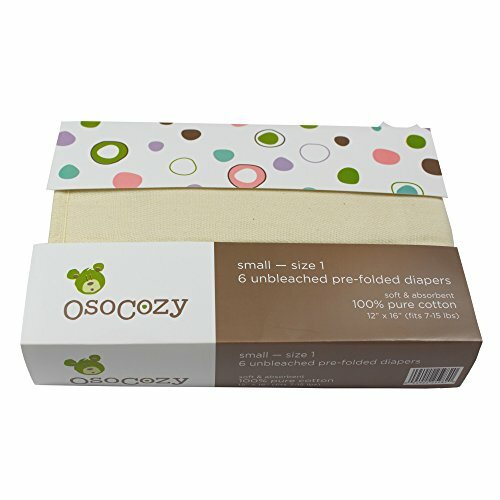 OsoCozy – Prefolds is a good cloth diaper for diapering your infant that is made of 100% unbleached Indian cotton and are super soft and absorbent. They come in packs of 6 prefolds. OsoCozy size 1 prefolds are 4x8x4, with the 8 layers in the middle panel and 4 layers in outer panels and fits babies from 7-15 pounds. They are durable and can be used for other household purposes once your baby out grows them. To make them completely water proof, you would have to use them with diaper covers. 782 reviewers on amazon have rated OsoCozy – Prefolds 4.3/5. 82% of users really like the quality and softness of these prefolds whereas 18% have not had a great experience. A lot of the users use them as burp cloth instead of diapers. 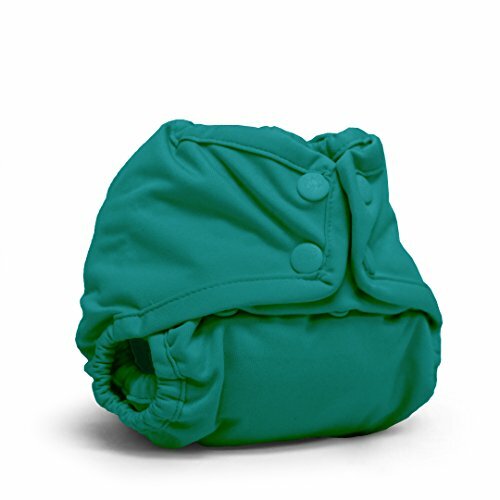 Lil Joey All in One Cloth diaper is ideal for baby diapering that is weighing 4-12lbs. They feature the patented double inner gusset leak protection design by Kanga Care brand diapers. The middle layer consists of four absorbent layers of microfiber and a soft and gentle microchamois inner along with a waterproof polyester TPU exterior. It has a snap down front which avoids contact with the sensitive cord area. Amazon users have rated these best cloth diapers just 3.9/5 by 233 users. They liked the material and absorbency but found it too difficult to get them completely clean. Another common issue highlighted by the users was that they are too small and due which babies out grow them really fast. With so much innovation in this space, cloth diapers are slowly becoming the first choice for a lot of parents especially for home use. The inconvenience of laundering them is just a little price you pay for your baby’s well being and other advantages they bring along with them. 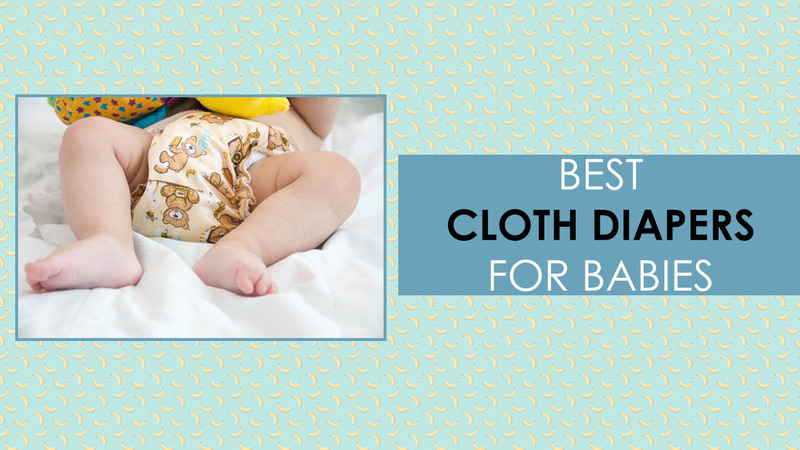 Hope this article has helped you answer all your questions about the best cloth diapers. In case you still have any more questions, feel free to contact us and we would be happy to answer them. Easymom baby cloth diapers are reasonably priced and come in a pack of 3 diapers, 3 bamboo terry insert, 3 bamboo charcoal insert and 1 diaper bag. You can choose from the variety of cute and vibrant colors and designs available for both boys and girls. They have specially designed separate diapers for girls and boys to make sure all the liquid is locked inside. You can also adjust the size using the three rows of snaps at the bottom and secure the waist row snaps overlaps for a perfect fit. The outer layer is made of waterproof and breathable PUL and the inner layer is made up of soft bamboo-charcoal cloth. With only 23 reviews on amazon Easymom has a rating of 4.9/5. The inserts are super absorbent and effective. Great for diapering babies that are heavy wetters and to use during night. Apart from them being a little bulky the reviewers have not much negative to say about these diapers. What are the types of Cloth Diapers? Flat Diapers: Flat diapers are your traditional cloth diapers, usually just a single layer of cloth in square shape or rectangle available in one standard size. They can be wrapped around your baby in many different ways and need to be secured with pins or snappies and also as they are not waterproof, you would require a diaper cover to prevent leakage. They are mainly made of 100% cotton or a mix of hemp and cotton which makes them very soft and easy to clean. They work out to be very economical as compared to the other cloth diapers but not as user friendly as the others. Prefolds: Prefolds are the next most economical cloth diapers available in the market. They are quite similar to the flat diapers but have multiple layers of fabric divided into 3 panels with extra layers in the center panel to make it capable to absorb more. These too need to be secured with a pin or snappi. You may use a diaper cover to make it even more leak proof as they are not waterproof by themselves. Prefolds usually come in three different sizes based on the weight of the baby: newborn, infant and premium. You would have to buy bigger sizes as your baby grows. But as they are made of cotton or hemp, they can be used as burp cloths, changing pads or cleaning rags once your baby outgrows them. Contours: Contours are a great option for newborns as they can be customized as per your baby’s size. They don’t need to be folded around the leg area like prefolds as they are tapered and shaped to fit the baby’s legs and has an adjustable band at the waist without any fasteners. You need to use a pin or snappi to keep it in place. They are affordable and easy to use but are not leak proof. A diaper cover would be required for the same. Fitted: Fitted diapers and contours have a similar shape; the difference is that fitted have snaps or hook and loop closures on the waist band. You don’t require any pins or snappies to secure them. They come in different sizes as well as one size fits all and multiple fabric choices depending on the brand you choose. 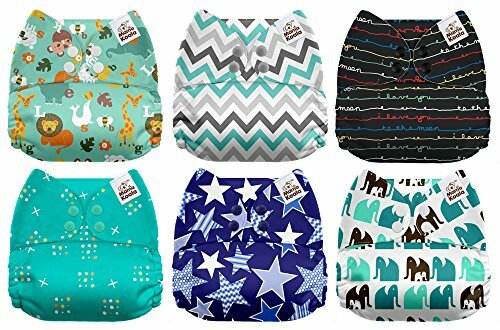 They are convenient to use with a great fit with elastic at the waist and legs and absorbency but still require a diaper cover as they are not water proof. They are slightly more expensive from the ones mentioned above but still reasonable. Some disadvantages that it brings along with it is that it doesn’t keep the baby dry and needs to be changed as soon as it is soiled also they take longer to dry as compared to the flat diapers, prefolds and contours. 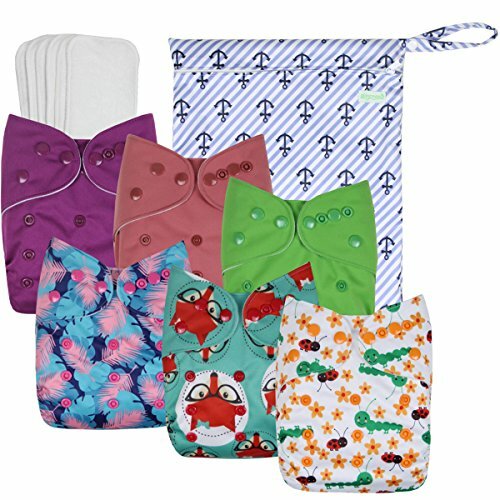 Pocket or Sleeve Diaper: Pocket or sleeve diapers are as convenient to use as the disposables which makes them the most popular choice amongst parents. They have an outer water proof layer and inner lining which are stitched together with an opening at the back to form pocket or sleeve to stuff the absorbent inserts. You can stuff inserts based on what level of absorbency you desire. The inserts absorbs the moisture and leaves the inner lining comparatively dry which reduces the chances of the baby getting diaper rash. You can also use the flat diapers and prefolds as inserts if you fall short of the inserts provided with the pocket diapers. You can easily fasten them with in-built snaps or Velcro closures. Washing them could be a tedious task as the inserts need to be removed before you wash them. 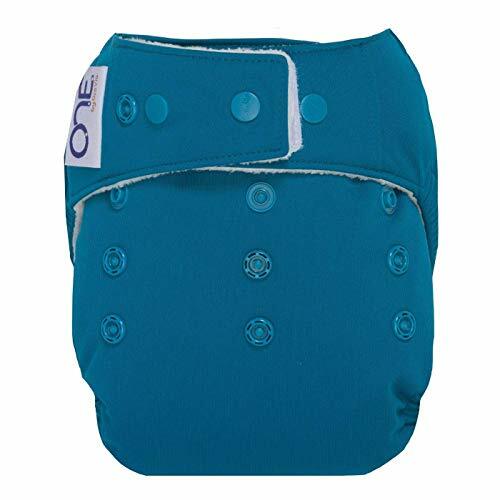 All in One: All in One is the most convenient of all the cloth diapers available and also the most expensive. They are just like disposables; just that you put them into the laundry once soiled instead of the bin and reuse them. It has a waterproof exterior with attached multiple layers of absorbent fabric inside and can be secured with the snap or Velcro closures. One drawback is that take a long time to dry due to the multiple layers. While all the types of cloth diapers come with their own pros and cons they work wonderfully in different circumstances. You can choose to use only one type or a mix of them based on your and your child’s requirements. Try and test them before you buy them in bulk as the material, fit and shape works differently for different people. The material of the cloth diapers also plays a vital role in determining the price and level of absorbency of the diapers. The material for the waterproof outer layer is usually PUL (polyurethane laminate) or TPU (thermoplastic polyurethane). The inner absorbency material used can be classified into synthetic or man-made and organic. Synthetic or man-made are materials like microfiber, suedecloth and microfleece whereas organic are all natural produces like bamboo, cotton, hemp and wool. Synthetic or man-made material: Synthetic or man-made materials like microfiber, suedecloth and microfleece are made with chemicals and petroleum. Microfiber is super absorbent but can cause rashes if used directly against the baby’s skin. Hence they are used mainly as inserts for pocket diapers. Due to its absorbent quality, getting the mess out of them could be slightly difficult and make them unfit for use over time. Suedecloth and microfleece on the other hand are used as inner linings for pocket, all in one and fitted diapers as they don’t absorb the liquid and keeps the baby’s skin dry. Organic material: Diapers made with organic material are comparatively more expensive than synthetic but are softer on your baby’s skin. The most commonly used is cotton as they are quite absorbent and soft which makes it great for baby’s with sensitive skin. But due to so much of demand, diapers are made of GMO cotton as well, so make sure you check for organic certification of the fabric before you buy cotton diapers. Bamboo is the next common material used to make cloth diapers. Their absorbent capability is better than cotton and is softer as well. One of the biggest advantages is its naturally resistant to bacterial growth. Hemp is another material that is naturally resistant to bacterial growth but not as absorbent as cotton or bamboo. It is generally used with cotton to make a hemp/cotton blend fabric. Another common material used is wool. Wool also has anti-bacterial properties but require high maintenance. It’s used to make diaper covers as well as it’s a highly breathable material. Apart from the types of cloth diapers, the cost and the material used we would like to touch upon some of the other questions that might be in your mind before you hit the store or the marketplace to buy your cloth diapers. How often do I need to change diapers? Newborns need a change of diaper more often as compared to older babies. The frequency of changing the diapers depends on the material of the cloth diaper you are using. If it’s suedecloth and microfleece every 3-4 hours should be good unless the baby has pooped. But diapers made of organic materials would require immediate change once soiled. What do I do with baby poops? Newborn babies who are breastfeeding have a very watery poop which is water soluble, doesn’t stink or stain and makes it very easy to clean. Just rinse it off once and put it in your dry pail, wet bag or washer. It’s as simple as that. But when it comes to babies on a solid food diet, the consistency of the poop would change to thick, sticky and smelly. You have to rinse and scrape out in pot before you put them in the washer. You can use the diaper sprayer, flushable liners or just a plastic spatula to clean. A wet pail can also be used, just toss in the dirty diaper in the pail and let it soak in the water until your laundry day. How do I clean the Cloth Diapers? Most of the cloth diapers can be washed in your washing machine with enough detergent unless stated in the washing instructions on the diaper packet. It’s best to follow the washing instructions mentioned by the manufacturer to increase the shelf life of the diapers. Using hot water to wash the diapers inserts is great to get rid of the odor and bacteria. Avoid washing the covers and all in ones made of PUL or TPU or diapers with elastic and snaps in very hot water as it could result in early wear and tear of the diapers. Also over soaking diapers made of organic fibers can deteriorate the quality of the material. If you do you laundry every other day you can wash them by hand as well. Drying them in the sun is a good way to get rid of the stains and smell. Picking the right detergent to wash your cloth diapers is as important as picking the right diapers for your baby. Cloth diapers are meant to absorb the urine and if it’s not washed with proper detergent it could hinder the absorbency of the diaper and make them smelly. They may also cause skin irritation if not washed off properly. Avoid detergents that contain soap, fabric softeners, phosphates, enzymes, whitening agents, perfumes, fragrances, dyes and alcohol. 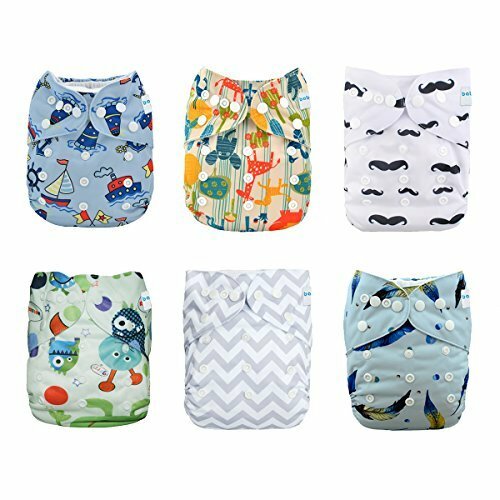 How to prepare the new diapers? Preparing the new diapers is very important. You need to wash them multiple times before you put them on your baby to get rid of all the natural oils present in the natural fabric and dirt to attain its maximum absorbency. Wash diapers made of organic material and synthetic material separately as the natural oils from the organic material can be absorbed by the synthetic material and hamper its absorbency. Based on the material the diapers would need to wash them at least 6-8 times before attain its maximum absorbency. You can use them initially during the day and after multiple washes feel free to use them overnight. Now you know what cloth diapers are and what they are made up of, we can move on the products that are available in the market. To help you pick the right cloth diaper, we have reviewed some of the popular options. Hope this further simplifies your decision making process.